Spring is here, officially at least. I guess it’s raining and April is nigh, so the whole “showers” aspect is legit. More importantly, there is a new trailer for the third season of ‘Stranger Things’ and it looks and sounds as stylish as hell. The whole gang is back - older, funnier and perhaps more nuanced than ever before - along with all kinds of oogie boogies. July 4th has never felt so far away. Time is but a window and I shall meet you there. Mr. M has been hunting in Paris for more of the black stuff and has returned with a most incredible box of delights. The remaster of ‘Transformer’ by Lou Reed is brilliant, uncompromising stuff, featuring the best press of ‘Walk On The Wild Side’ that I’ve ever heard. Also, it was produced by Bowie and Mick Ronson and the ingredients list reads like a who’s who of the heaviest cats in the early 1970s. Speaking of the thin white Duke, ‘uǝɥʇɐǝɥ’ is as much of a direct revelation now as it was in 2002. It’s a great piece of very red vinyl and the rear cover artwork was very much a direct response to the Twin Towers, as was the penultimate, guitar feedback-driven track, ‘A Better Future’. Seriously: revelation. Easy off the bus, we are with the Dude himself. 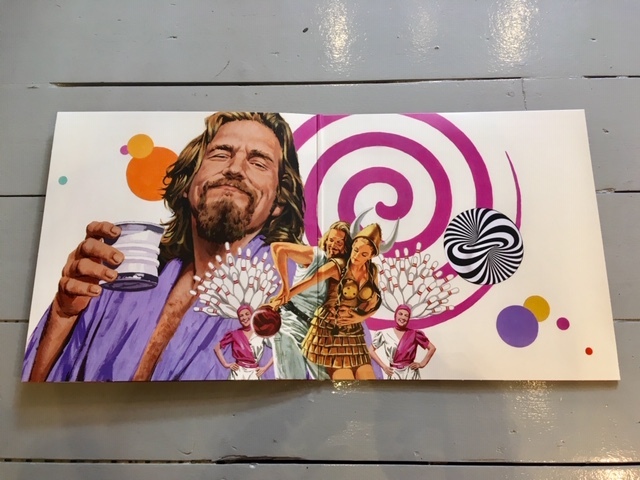 Mondo’s excellent pressing of the original motion picture soundtrack to ‘The Big Lebowski’ has everyone from Dylan to Nina Simone on it and a really beautiful, storming flamenco rendition of ‘Hotel California’ by Gipsy Kings on side two that needs to be played all. the. time and if Paul Mann’s cover artwork never grants him a sainthood then I honestly don’t know what kind of world we live in. Image courtesy of Titan Books. Nancy Holder went and released a new Firefly novel last year and no-one told me. Mighty inconsiderate. ‘Big Damn Hero’ (Titan Books, 2018) is, thus far, popping along at a good pace. It’s definitely true that it leans more to the faithful side of things, with some pretty serious telling as opposed to showing early on in the book and I wonder if we might branch out beyond that slightly awkward fan service at some point. There are another two books in the works, the first by James Lovegrove that is imminent and a second by Tim Lebbon coming later this year. So we’ll see. Provided you can fly over that hurdle, it’s absolute magic to be back on board Serenity with Malcom and fam again. Holder has the world and characters down cold and it has to help that Whedon’s taken up co-pilot duties some part. Perhaps the most exciting thing to think about is that Disney won’t be sitting idle if they can see continued interest in the Firefly universe. If you’re someone like me who’s still not completely [it was a pretty shiny package but moreish for sure] over Fox’s abandonment of the original series back in ’03 then you should grab your Vera, dust off and get space side with this, sharpish. We can have the sky back. Jack de Quidt’s love for a particular strain of indie crop was just the right dish with which to close out a hectic mid-week rummage though the sometime anaemic and serious cross section of internet on which I normally graze. That precise degree of joy, in turn, led me to forward a video of that Baba game (there are 500 of these puzzles and I am deep) to Mr. Bass. By way of return, I received this and my life is ever changed. ‘7 Billion Humans’ by Tomorrow Corporation is so good, so expectedly on point for a suggestion from that quarter and so, so wonderfully political that I am compelled to share. I also wonder whereby Quidt’s line through Vice on this fell off, particularly in light of his lead to Simon Stålenhag’s ‘The Electric State’ which struck me like a fork in perpetual harmony around Xmas. Come back, mother fucker. We need you.